Here's a view to the inside of the skirt. 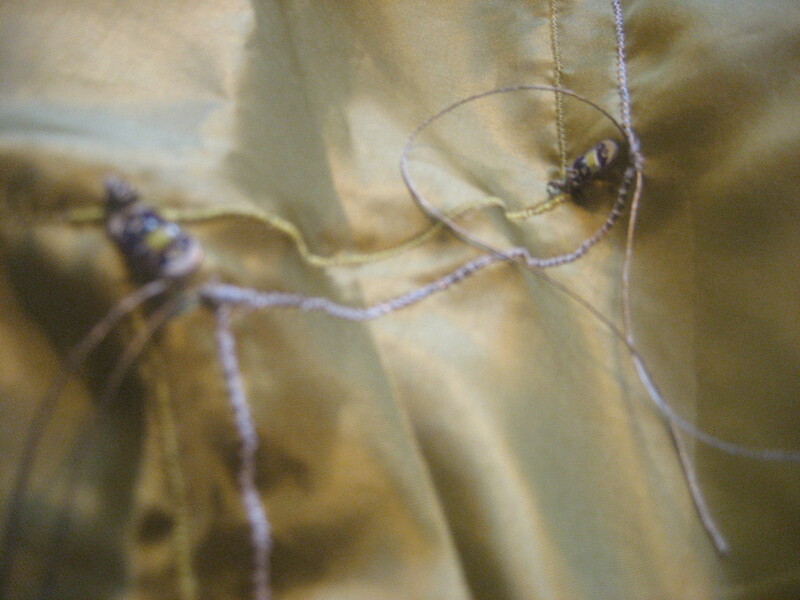 The conductive thread was encased in a tube of zigzag stitching for insulation purposes. The little purple pads are sewable lilypad LEDs. 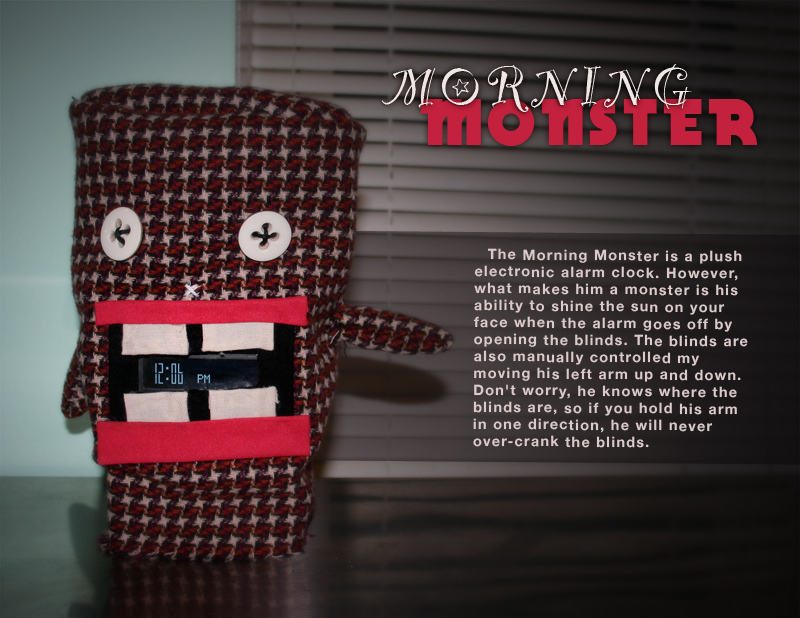 Summary: The Morning Monster is a plush electronic alarm clock. He has all of the normal alarm functions, set time, set alarm, snooze, etc. However, what makes him a monster is his ability to shine the sun on your face when the alarm goes off by opening the blinds, unfortunately in the video, it is night time and pitch black outside. The blinds are also manually controlled my moving his left arm (our right) up and down. Don’t worry, he knows where the blinds are, so if you hold his arm in one direction, he will never over-crank the blinds. GRR–. Morning Monster from Nick Hardeman on Vimeo. Breakdown: The clock hour and minute are set by pressing his top teeth, while the alarm hour and minute are set by pressing his bottom teeth. The alarm is activated by pressing his nose (I have to sew a white X on). 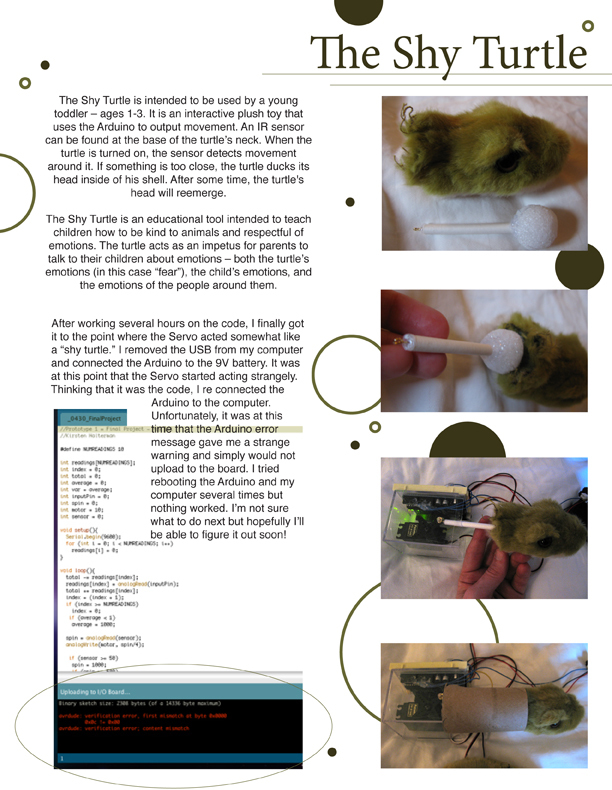 There is functionality for the snooze and it works by giving the sleepy head 15 more minutes of bliss, but I have not added the capacitance touch to activate it yet, its wired inside and the code is functional. He controls the blinds with a flex sensor in his left arm (your right). Moving it up or down opens and closes the blinds. He keeps track of the blinds so that they will not be over-cranked and so he knows how far to rotate to open them. So no matter where you open the blinds manually, by moving his arm, when the alarm goes off, he will open them to the correct position. 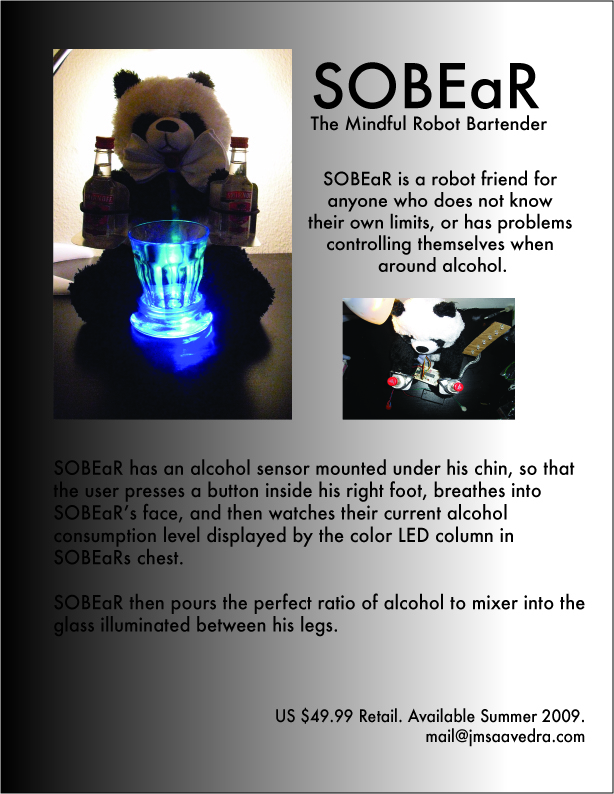 He talks with the blinds via wireless communication through an RF transmitter and receiver with a protocol that I wrote. He has an antenna inside him and the range is good, even through the material. There is a receiver in the little black box in the window, with a blue antenna that translates the signal and activates the blinds. The monster and the blinds are powered by plugging into the wall, that is what those little white wires in front of the blinds are in the video. A piezo speaker makes an alarm clock sound when it goes off, but somehow there is no sound in the video, so you can’t hear me either. The black box that controls the blinds houses a 12V stepper motor, driven by a h-bridge motor driver, a wireless receiver and of course, a MAPDUINO. I breadboarded all of this project for time and sanity sake. The stepper motor sits in a cradle created by two i-hooks so that it can move accordingly and can adjust to many angles when installing this puppy.